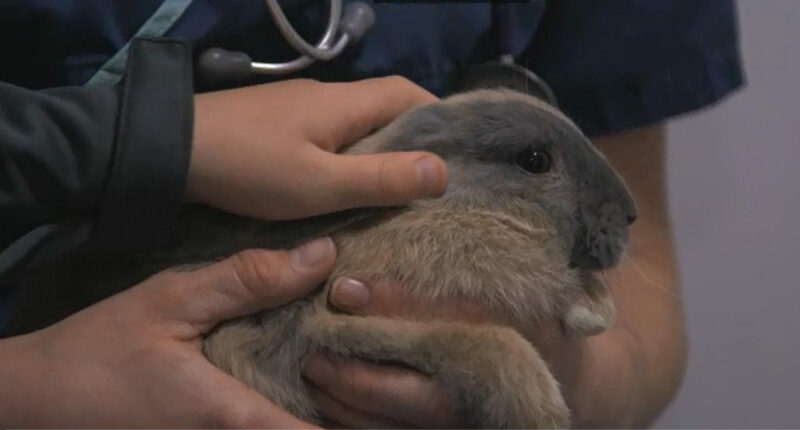 Naomi brings in a young rabbit called Speedy with a broken leg. His increasing attraction to his female companion, Rosie, meant he got a little too close…. In no uncertain terms Rosie let Speedy know his advances were unwelcome and a fight left him with a badly broken leg. Noel can operate but the bone was one of the smallest he has ever operated on. To add to the pressure, rabbits notoriously do not cope well under general anaesthetic, so Naomi returns in the evening with her young sons, who adore Speedy, to say goodbye in case he doesn’t make it. 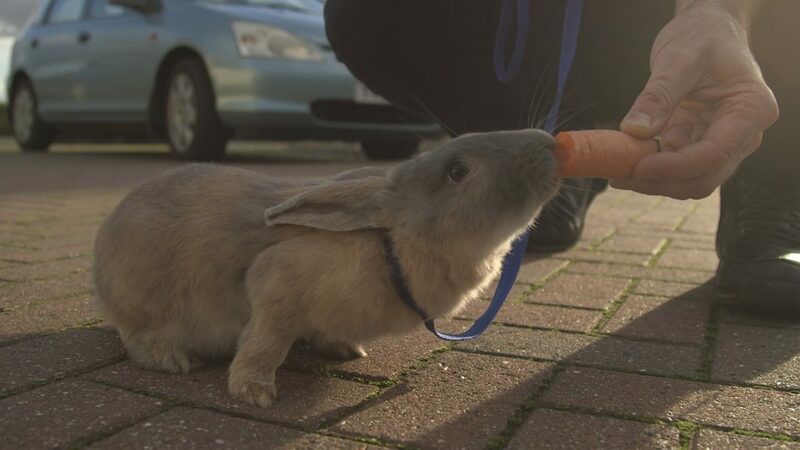 Exuberant rabbit Speedy came to visit Noel and the team at Fitzpatrick Referrals after having sustained an injury while playing with his rabbit friend. Speedy was not using his front right leg and was obviously in pain when he attempted to move it. Noel suspected the little rabbit had fractured his humerus, and x-rays confirmed Noel’s suspicions. Rabbits do not always cope well with general anaesthetic, so Speedy’s loving family returned in the evening so they could spend some time with Speedy, in case he didn’t make it through. They left Speedy in the care of the team, knowing that they were doing the very best thing that might enable Speedy to heal and overcome his injuries. After carefully anaesthetising Speedy, he was prepared for theatre. In a sea of blue and green sterile drapes, all that could be seen was a tiny little leg. Speedy’s leg was badly fractured and it was going to take precision and skill to piece the bones back together. Noel worked painstakingly to bring the small pieces of bone back together, by using a combination of internal rods and a complex external skeletal fixator. Once surgery was complete, Speedy made a good recovery from anaesthesia. He also coped exceptionally well with his external fixator and was soon back to his cheerful self. Due to the complex nature of the fracture he stayed at Fitzpatrick Referrals for three weeks while his fracture healed. This allowed the nursing team to care for Speedy around the clock and make sure he was eating and drinking well with his external skeletal fixator. Once the three weeks were up, his external fixator was removed and the dedicated physiotherapy team got to work training Speedy to use his leg normally again. 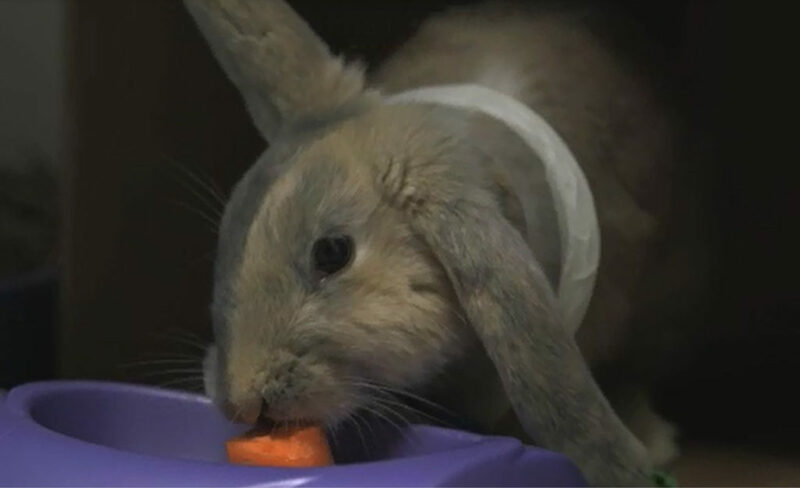 After another week at Fitzpatrick Referrals Speedy was using his leg very nicely indeed and Noel returned this beautiful little bunny back to his eagerly awaiting and joyful family. I love being a vet, I really do. Whether I’m helping a dog or a cat or a hedgehog or a rabbit, I get to give a little bit back to creation every time. And in the case of Speedy I also got to bring joy into the lives of two wonderful young boys and their lovely family who care deeply about him. We can’t underestimate the importance for a young child being involved in the decision making process… and the life or death dilemma involved in a situation like this. I truly believe it shapes their perception of right or wrong, their emotional intelligence and how they deal with death and other ethical dilemmas for the rest of their life. They did amazingly well and knowing them has been truly a joy for me. It has been a complete honour for myself and my team to serve this wonderful family. The surgery was tough. Really tough. The fracture was into the elbow joint and the home was in many pieces, all tangled in the tiny nerves and blood vessels. There was certainly a point where I felt I wouldn’t win and I’m so glad that things have worked out. Of course I only play a small part, the part of the mechanic. Really it’s the team of amazing and dedicated nurses and ward staff and physiotherapists that interacted with Speedy and grew to love him day by day that truly made the difference between survival on four legs or not. I’m so proud of all of the Fitz Family. They’re the greatest bunch of people on planet earth. Thank you! Thanks also to Speedy for keeping up the fight and for healing and thanks to his family for giving him the chance. There is no greater feeling as a vet than for me to repair this little bundle of joy and to put the “speedy step” back in the stride of these two little boys and their family. As a vet it doesn’t get any better. Well done everybody for making the world a better place one bunny at a time!